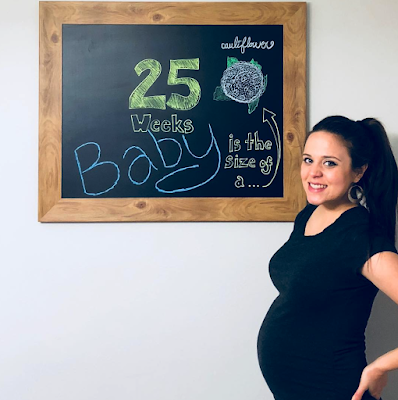 Jinger Vuolo just passed her 25-week marker, which means she is about to enter her third trimester. She and Jeremy have not yet revealed the gender, but they have said that they plan to, so stay tuned! Meanwhile, Kendra Duggar is 30 weeks pregnant with her son. Her due date is Father's Day. She looks good and hasn't put on as much weight as Joy did at this stage of her pregnancy. Perhaps she won't have a huge baby and won't need a C-section. huge Babies aren’t the only cause of c-sections. There are many other reasons why she could end up needing one. Of course I don’t wish for her to go through this but just because she isn’t big doesn’t mean she could have complications. Is she having a baby or a Cabbage Patch Doll? Yes, she could just say "Baby is 8" long" and stop with the vegetable comparisons. I wouldn't want to find out someday that my mother compared carrying me to carrying a cauliflower. @10:59. Maybe you need a tougher skin. It's a good way to give peopke a visual idea of the babies size. Lighten up! Of course they will reveal the gender, hahaha. I predict we will find out within the next 15 weeks or so. Yes. We found out TODAY. It's girl. So there you go. Please tell me that they aren't going to stage some elaborate gender reveal with things popping or exploding or being dropped from a plane or getting shot at..... What happened to simply spreading the good news by talking to people?? Of course there will be some sort of "reveal party". That's what Duggars do. You mean like Joy and Austin did? You can take the girl out of the Duggar but you can't take the Duggar out of the girl. Don't be so grumpy. Gender reveals are fun! Especially when it's for your FIRST baby. It is over the top nonesense! And it emphasizes the wrong thing! Tight shirt, arched back, another huge baby......another emergency c section? I agreed with you about the tight shirt and arched back, but her bump does not indicate a huge baby. I think she is only wearing the t-shirt for the photographs so we can see the bump size, but any photographs I have seen of her unlike her sisters she has been in cute non tight outfits (excluding the skinny jeans which she looks great in). Pregnancy agrees with Jinger, she wears it well, and I hope she doesn't need an emergency c section. Interesting they don't wear them skin tight any other time. They seem to want to draw attention to themselves. What happened to drawing attention to your countenance? 5:44 PM -- Pregnancy is a big deal for them. I'm not going to say it's their idol, but they seem to deviate from usual modesty standards during pregnancy. Jinger, you look so cute! I hope you a baby are doing fine. Jinger looks great! Healthy. Fit. That’s so refreshing. I love how Jinger illustrates the size of the baby like this. I think it is helpful to any Pregnant woman who is thinking about abortion to see the size of their unborn child and to realize that this is the size of your baby. They let woman abort their babies up to 24 weeks which just breaks my heart but maybe a woman will see this and it could change her mind. We need all the help we can get out here fighting for the unborn and everything like this helps. The Duggars aren't planning on aborting their babies. Most abortions occur in the first trimester of pregnancy and it really isn't our job to "fight for the unborn" as there's nothing in the Bible that prohibits abortion. The most effective way we've seen to reduce abortions is through proper education and access to contraceptives. I cannot believe that you brought abortion into this, 2:39. Or that you think some woman considering it would look at a vegetable and change her mind. I am flabbergasted. Please visit a pro life website.....Jinger is having her baby and we don’t need to discuss this very political topic here. 2:39 You say you want to fight for the unborn. Can you answer a question that has confused me? If children are a gift from God, then they come from God. And they supposedly go back to God after death. So their souls are with God before and after life, and being with God is said to be a much better place than here on Earth. So why is abortion so troubling to some religions? Isn't the soul going right back to God, a better place, and then free to come back here later in a different body? Maybe to have a better life then, too? Death is not supposed to be the end, but the beginning. God has control of the soul no matter what, right? So why is a medical procedure so bad, if it's powerless to stop a soul from God's ultimate control? Even if laws were changed, abortion will never be eliminated. We've been there, tried that. We don't live in a perfect world and desperate women will resort to desperate measures, which unfortunately is what happens when abortion is criminalized. I think it better to provide safe, accessable and affordable procedures, so that a woman seeking an abortion can do so as early as possible in the pregnancy and avoid delay. My grandmother, already a mother of four, nearly died of a self-inflicted abortion during the height of the Great Depression. Had she been able to have one legally performed at the time by a doctor, her children would not have been at serious risk for losing their mother. While I am eternally grateful that the biological mothers of my adopted children chose to bring them into the world, I am also extremely thankful that they were not forced to do so under the threat of a punitive law. 12:59 - - By your logic, then the murder of a Christian child or adult is not wrong. Anon@12:59 You took the words right out of my mouth. I would add that I think it is most important that we concentrate our efforts on helping the suffering souls already born into this world. How about we fight for all women by making sure they have access to affordable contraception? The goal should be making every effort to prevent unwanted pregnancies in the first place. 10:29 read Proverbs 6:17. If a fetus heartbeat begins on day 18 and pumps blood on day 21, what is more innocent than an unborn developing child and God detests the shedding of innocent blood. Sounds like God does have something to say. "Thou shalt not kill." 1:23, what if your parent hadn’t been your grandmothers 5th child who she aborted. You would never have been born. Abortion is murder and the Bible says thou shalt not kill. AnonymousApril 9, 2018 at 1:23 PM Great way of putting it. 5.49 how dare you?! Judging what a woman will do for her born children and unborn children in the great depression?! Not saying abortion is the greatest answer but I am guessing she did what she thought was the best at that time with the knowledge she had at that moment! That remark is so offensive I do not even have the words for it. 5:49- A woman is born with nearly 2 million eggs, all having the potential to create a new human being. Are we to grieve for the vast majority that die? If I'd never been conceived, there would be no awareness or comprehension of anything, just sweet oblivion. I wouldn't say that's a horrible proposition. anon 5:52- You are free to believe that and never have an abortion. However, a great many people do not share your Biblical interpretations or views on abortion. Among them is the Supreme Court. Their 1973 decision was based on a woman's right to privacy and that no government may interfere in a woman's reproductive choices. To anyone who says the Bible does not prohibit abortion -- The Bible says God knew us in our mothers' wombs, and the Bible also prohibits murder. You can surely do your own research looking up the verses. But don't try to pretend it's not there, because it's in black and white. Proceed at your own risk. To Anon 7:30. Jeremiah saying "God knew him in the womb" does not address anyone but Jeremiah. It had nothing to do with anyone else. If you think abortion is murder, then don't have one. Stop making up stuff to support your opinions. 12:41, murder is murder, and my point is if 1:23 s parent had been the baby aborted 1:23 would never have been born. I’m sure she’s glad that didn’t happen. And 5:09, those eggs are not fertilized, and aren’t babies. 6:06, I’m curious, when do you think a fetus becomes a baby? When is it no longer ok to murder it? Ripping a baby to shreds is disgusting. When you throw God into any mix like this, things do become a tad illogical. He's not in the baby making business, we are. And sometimes bad things happen to us, and we have to deal with it here and now. 2:08- There are already restrictions on the window of time for an abortion in almost every state. As long as woman choosing abortion does so within the parameters of the law, it should be of no concern to you or anyone else at what point she has the procedure. Jinger looks right on track for 25 weeks and beautiful! Praying for a safe, uncomplicated delivery and healthy baby! JInger looks so cute! When will you post another closer up picture of Kendra in her pregnancy? You could not tell anything from the last one that was posted as it was so far away. Perhaps Kendra doesn’t want close ups of her baby bump posted on the internet. Let’s respect her privacy. Another round of the Duggars Can't Win. Some people are disappointed not to see Kendra's baby bump. But if such a pic of Kendra is posted then you can be sure that a bunch of critics will lament how classless she is to flaunt her baby bump, and how disappointed they are that she's not actually "classier" than the Duggars. And someone will find a way to bash on Joy Anna yet again. I'd love to see more about Kendra and the new house. How is she spending her days (at the large house or ???). What is Joe doing for work? Will they be able to move to their own house one day if he gets some magazine articles and a birth special from tlc? And that’s what you call back handed sarcasm.....rude! It was said that Kendra and Joe live in their OWN house that was once owned by "Grandma Duggar" and moved to the Duggar property then renovated for them. Joe works for the "family business" although it's unclear exactly what he does. If the house was grandma's and sits on daddy's property next to his house, it's really not "their own," now is it? I HOPE ITS A GIRL. I'm glad to see that Kendra isn't into the "side view" photos with a tight top on. She looks like she is wearing the same shirt in each picture that she has posted. Babies grow, so shirts that were once loose are not anymore. Maybe she hasn’t purchased many maternity clothes yet as she is just now needing them. Neat bump. As she's baby in blue again I'm simply going with a baby boy. Girl is a knockout, and her husband is so handsome. They are going to have one cute baby. Hope he or she has dark hair and eyes like Mom and Dad. Most of the Duggars are so fair, it would be fun to mix it up a little. I was kinda hoping you guys could help me out! I’ve been trying to get in contact with Joe and Kendra and Si and Lauren but have come up empty handed at figuring out how. The Lord has really put a desire in my heart to reach out to them. Do they have emails so I can write to them or some other way to contact them? I’d really appreciate your help! Thanks! Can you send us an email (duggarfamilyblog@gmail.com)? No. The 3rd trimester starts at about 26.5 weeks. (Pregnant with my fifth here). They said “about to enter third trimester”.....just looking for a reason to be critical? Third trimester starts at 28 weeks. Not 26.5 weeks! I know this for fact-I am insurance Medical Coder!! Aw, she's looking good. Hoping it's a girl!! Jinger is rocking the tight maternity tops now. I'm a lot more "worldly" than the Duggars -- in fact, I had a child out of wedlock -- but I would never have worn a skin tight top. I honestly don't get it. Most pics of Jinger are in loose tops and dresses. I think she is wearing a tight top in the pregnancy update photos to intentionally show the changing size of her belly. Give her a break, it’s their first baby and I’m sure they are very excited. Like all Duggars, pregnancy makes her even more beautiful! Can't wait to find out! ! or do you count different? for me, week 25 is 24weeks+ 0 to six days. Kendra is due in mid June. Jinger is due 5 weeks later which means toward the end of July. She's entering her 7th month of pregnancy which is the 3rd trimester. Maybe your doctor can explain it to you. I understand that pregnancy and adding a new member to a family are major milestones for those families to celebrate, but I don't understand the admiration and praise given to these young women simply for becoming pregnant. It takes no hard work or talent to become pregnant. In fact, in the less-fundamentalist world, many young wives who become pregnant immediately after marriage do so to avoid "having to work." They are reality tv stars, so of course they are going to get noticed and praised ( and criticized) for what they do. It's part of being on tv. Almost all woman get praised and congratulated too when they get pregnant , even though it's just by family and friends. No one is saying these girls are performing a miracle or doing exceptionally hard work when they get pregnant. If you are on TV, you are going to get praised and criticized. For a lot of us, it does take a lot of work to become pregnant. As someone who had difficulty conceiving, your comments are unnecessary and unkind. Do you really think people are celebrating conception? People are celebrating the new life.... which is a gift from God. New life is always a miracle and a blessing! Wow....I don’t think those young wives get pregnant to avoid work....that was rude. Well if anyone becomes pregnant and has a baby to "avoid having to work" they soon discover a baby is a 24/7 job. I really don't think that happens. 12:59 -- Yeah, but parenthood is a different kind of work -- usually much less stressful, at least, that is, until they reach the teenage years. Seriously???!! Babies are a 24/7 job! I have a friend who went back to work to avoid being a stay at home mom! You just insulted many women who can't get pregnant but have worked to try. Shame on you!! Good grief. I don't think 9:22 is disparaging women who have a hard time conceiving. I could never have biological children and don't take her comment that way. I think her point may be that for the Duggars, gettting pregnant appears to be effortless- and they've exploited their fertility by making it the cornerstone of their TV show. Without that, TLC wouldn't have given them the time of day. 5:55 PM -- What kind of work did your friend who left her baby at home to go back to work do? If she was in a profession like attorney, accountant, etc., I can't imagine taking care of a baby would be more stressful. But maybe she had an extremely difficult baby, in which case the baby would need its mother more than ever. I’m sorry that you feel that way. It took me a long time to conceive my child. And I had a very difficult and intense pregnancy. My son was also born 9 weeks premature. So for a while it was touch and go. Then his whole first year was of sleepless nights and preying that he would be alright and each milestone was a miracle. So to presume that a woman no matter how young or old gets pregnant to advoid work is just wrong on so many leaves. Because pregnancy, birth, and then the raising of that child. Is all work. From he first time you hear their heart. To the last time they hear yours. I like when some keep the gender a secret. It keeps everybody guessing. And the name too. But to each their own. I'm going to keep my eye-rolling in check after reading some of these other comments, and just say that Jinger is looking good and that I'm happy for her and Jeremy. I hope fore the first girl in the family! What about McKenzie and Meredith? Jingers baby will not be the first granddaughter....there has been a string of boys for sure. She is a Duggar girl. And her baby girl will be the first real granddaughter. 3:15 so McKenzie and Meredith are real granddaughters? Cause there really is no other way to take that. They have Duggar blood in them too just as much as this little girl does. Both this comment and the OP are rude. Just because Josh made mistakes and people don't agree with Anna choosing to stay in her marriage doesn't mean we should forget about the two beautiful daughters Anna carried and delivered. The first “real” granddaughter.....what are McKenzie and Merideth? ??? Josh has daughters. What leads you to believe they are not "real granddaughters" to Jim Bob and Michelle? First "real" granddaughter?!? What does that even mean? So josh and Anna's daughters aren't real? That's the silliest comment I've read on this blog in a long time. McKenzie and Merideth have duggar blood too. Their last name is even Duggar! I am looking forward to seeing Jeremy and Jinger as parents. I admire this couple for balancing Jinger's strict upbringing with Jeremy's more modern lifestyle and can't wait to see how this impacts their parenting. I hope their little girl is allowed to wear pants/shorts and explore whatever interests her.